Monday’s 1% jump up in prices a reaction to cooler forecast change mid-April. Big warm-up coming this late this week through early next week before things turn cooler. High temperatures in the 70s possible across sections of the central U.S. this weekend. April is the second fastest warming month of the year. Despite the cooler pattern coming in the 6-10 day or mid-April, the sentiment remains overall bearish as injection season gets underway. On Monday, the front-month May contract settled up over 1% (+$0.046) to $2.71. As of Tuesday morning’s trading session, the front-month contract is down 1% to $2.68. 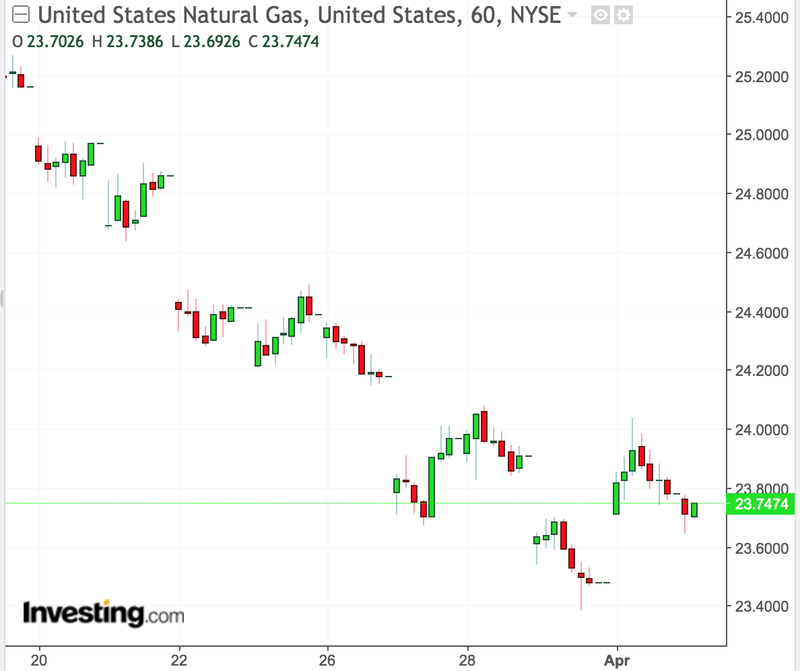 The United States Natural Gas Fund (UNG), which is the un-leveraged 1x ETF that tracks the price of natural gas, is down 0.88% to $23.59. VelocityShares' 3x leveraged (UGAZ) and ProShares' 2x leveraged (BOIL) was seen down 2.17% and 1.67% to $29.38 and $20.61, respectively. 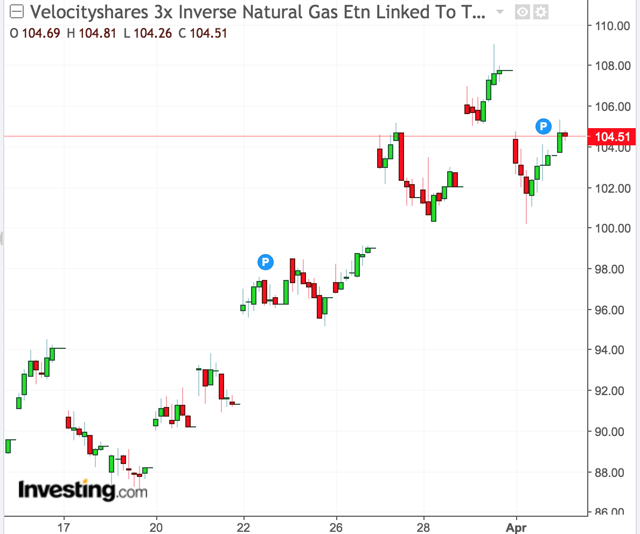 Meanwhile, VelocityShares' 3x inverse (DGAZ) and ProShares' 2x inverse (KOLD) were seen up 2.33% and 1.29% to $106.00 and $22.22, respectively. Figure 1 below is a chart showing the price trend of the front-month May futures contract over the seven trading sessions. Figure 2 below is a chart showing the price trend of UNG over the last nine trading sessions. Figure 3 below is a chart showing the price trend of DGAZ over the past couple of weeks. April is the second fastest warming month of the year when normal high temperatures from the beginning of the month to the end jumps double digits. 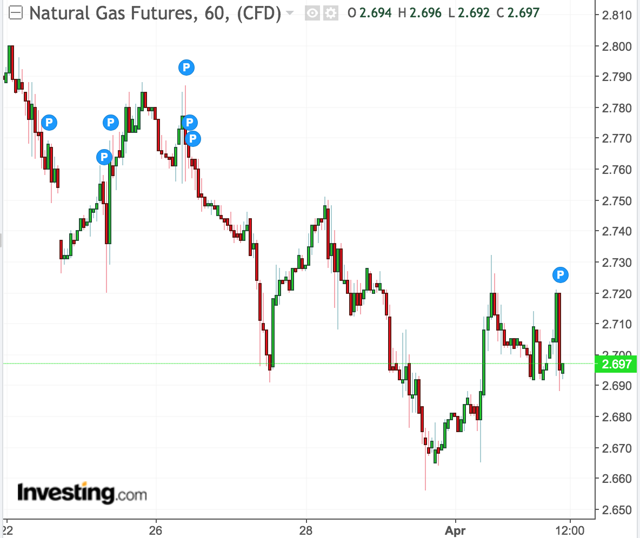 As additional minutes to sunshine is on the way, it will get harder for any cool intrusions to have any meaningful effect on natural gas demand. As injection season kicks into full gear that will be the case moving forward. The weather pattern is currently driven by a highly amplified jet stream configuration with strong ridging over Alaska and downstream troughing over northern/central Canada into the Lower 48. This is what has brought cooler weather across the nation’s mid-section. This amplified set-up will dissolve over the next 5 days and in its wake will be an eastward propagating, negatively tilted upper level trough over the eastern Pacific that will influence our weather pattern with multiple shortwaves (in the form of showers and thunderstorms) being ejected out from it over the next two weeks. In addition, the fading away of the upper level ridge/downstream troughing will help to settle or flatten the jet stream pattern into a zonal (east-west) configuration. So over the next 5 days, this will allow for temperatures to moderate or warm over the central and eastern U.S. with the greatest warming centered over the central U.S. The warm-up will be centered on this upcoming weekend. In fact, many locations across the central U.S. could see daytime high temperatures top out into the lower 70s. Temperature anomalies will run 10-20 degrees above average across the nations mid-section this weekend. Beginning in the 6-10 day (medium-range) period, there are marked differences between model solutions in the handling of the upper level situation. While all models show some ridging building across the western U.S., the GFS/GEFS is a bit more aggressive (more pronounced) with it and doesn’t acknowledge the eastward advancement of the upper level trough over the eastern Pacific. Instead, the GFS as a result of this building ridge develops an upper level trough much further downstream across the eastern U.S. The ECMWF, its ensemble, CMC/GEMS all show a less pronounced ridge developing over the western U.S. and acknowledges the upper level trough over the eastern Pacific and its eastward progress into the western U.S. Further along in the medium range, the pattern is set-up where there is mean ridging stretching from the northeast Pacific into Alaska, Canada, and the higher latitudes, while upper level lower heights are seen over the Lower 48 (particularly over the western half of the country). 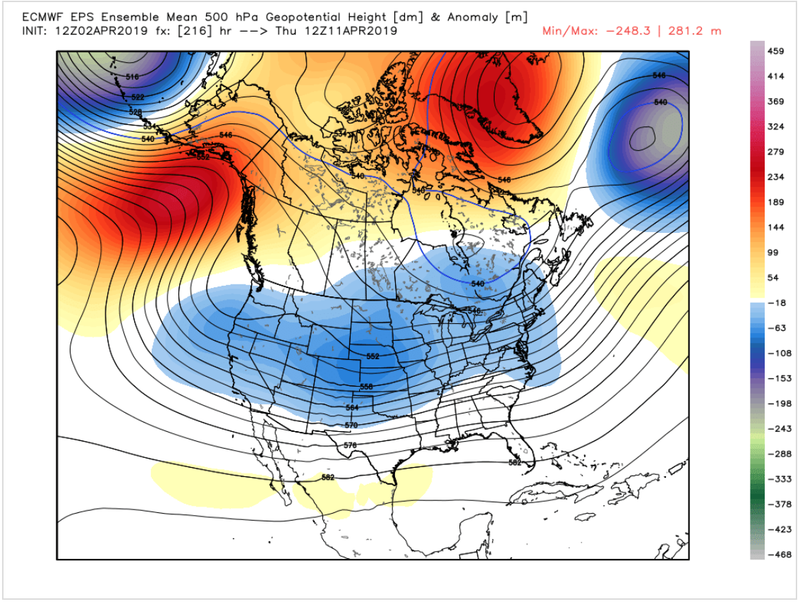 This has the look of a potential blocking pattern taking shape during the middle third of April (April 10-20). I have taken a blend of the ECMWF/CMC/GEM/NAEFS models. Figure 4 is a map from the 12z ECMWF depicting this block-like pattern in the upper levels of the atmosphere on April 11. With that said, in the 6 to 16-day period, expect for things to cool down especially across the northern and western half of the country. The bulk of the cool air will be centered over the central U.S. from the Rockies into the Midwest (similar to this past winter). The cool down however is not going to be significant enough to drive strong demand, and can also be driven by multiple quick-hitting storm systems that will travel across the country during this time period. 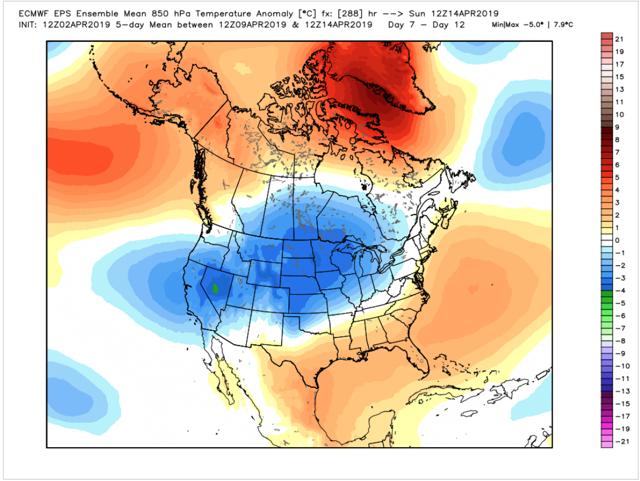 Figure 5 is a map from the 12z ECMWF depicting cooler than normal temperatures (in blue) across much of the country in the 7 to 12-day time frame (April 9-14). Warmer than normal temperatures (in orange/red) are observed across the southeastern U.S. and in the higher latitudes from the northeast Pacific, Alaska, northern Canada into Greenland. This upper level pattern set-up and cooler risk during the middle parts of April aligns well with the Arctic Oscillation (AO) going into a negative phase. Figure 6 is the observed (black line) and a 2-week ensemble forecast of the AO (red lines). In terms of how this will impact the markets, I don’t think this cool-down will not have much of an impact moving forward. Monday’s reaction was as a result of the cooler changes, however, in terms of heating demand it will not have much of an impact to injection season. The May front-month futures contract should trade within a 20-cent range over the next week between $2.60 and $2.80. 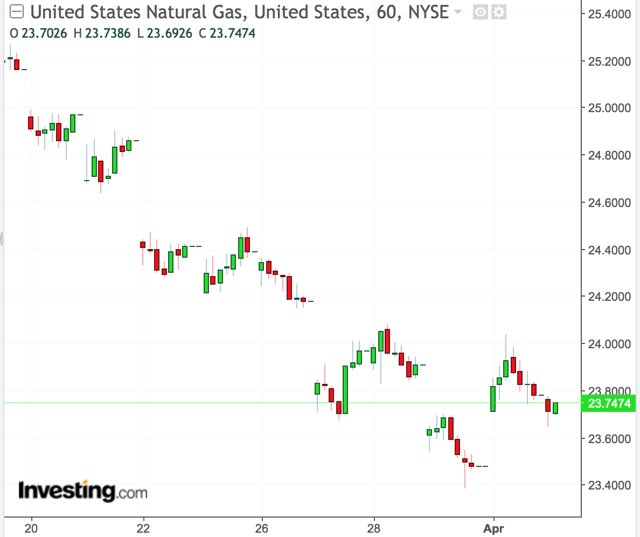 Look for UNG to trade between $22.60 and $24.60. 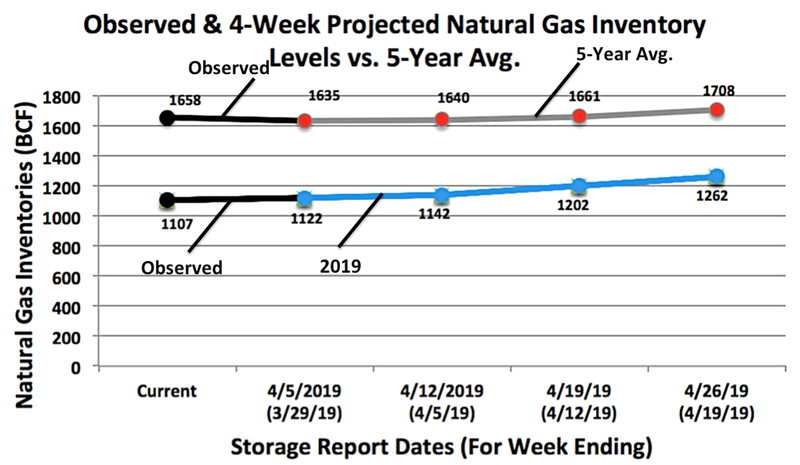 Figure 7 below is my natural gas inventory withdrawal projections over the next 4 weeks vs. the 5-year average and the total 4-week projected level vs. the 5-year average. 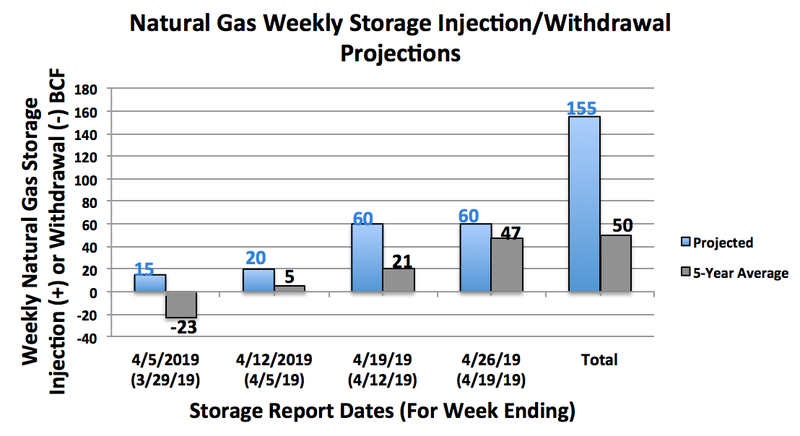 Figure 7: Natural Gas Weekly Storage Injection/Withdrawal Projections over the next 4 weeks. Figure 8 below is the observed or current Nat Gas inventory level and my forecast levels over the next 4 weeks vs. the 5-year average. Figure 8: Observed and 4 week projected natural gas inventory levels. Finally, figure 9 below is the current storage deficit level and my 4-week projected deficit levels. Figure 9: Observed and 4 week projected natural gas storage deficit.